The idea for our concept emerged during a dinner in 2008. Now 10 years and two name changes later CoffeeRoastery evolved and improved but still holds true to the essence of the concept. Our aim is to create an easygoing atmosphere where one can be surprised by our ever changing selection of high quality coffees and healthy delicious lunch options. All the beans we serve are always freshly roasted and carefully selected for quality and flavour. We offer a diverse selection of 100% Arabica specialty coffee all with cupping scores of 84+. All our beans are also available for at home, at the office or for your own enterprise! We invite you to take a look at our current offer! 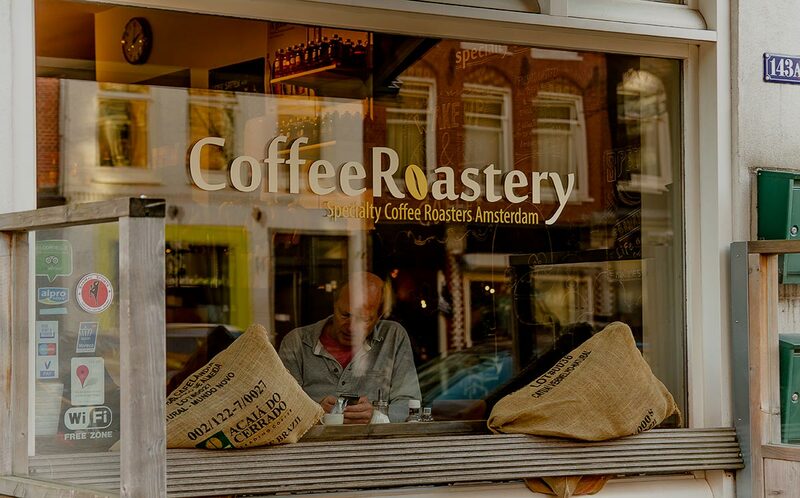 The CoffeeRoastery espresso bars are all located in Amsterdam-West. Our in store roastery is situated in the store at de Clerqstraat. The locations Jan Pieter Heijestraat en Van der Hoopstraat are both in the vicinity of a lovely downtown park, the VondelPark and Wester Park. Our fourth store is located at the bus departure square on Sloterdijk Station. CoffeeRoastery is more then just coffee. We also serve freshly pressed juices, home-baked cakes and generously topped warm sandwiches. Come in and be surprised by our offerings!. Our entire menu is also available for taking out. To be enjoyed at home or in the park. Onze gehele kaart kun je zowel bij ons aan de bar bestellen maar ook meenemen naar huis of bijvoorbeeld het park. Woon je in Amsterdam? Foodora bezorgt voor ons in bepaalde gebieden in een straal rondom de vestigingen. De bedrijven rondom onze vestiging sloterdijk kunnen na een pre order 1 dag van te voren door ons zelf geleverd worden. Bel dan met ons telefoonnummer van de vestiging CoffeeRoastery Sloterdijk.